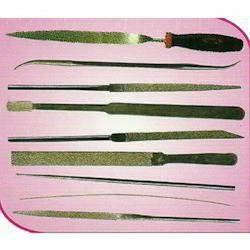 Diamond files are offered in the form of Needle Files, Riffler Files, and Diprofil Files and in the normal sizes. Machine files also can be supplied against customer’s specifications. Thin Flat files/special Machine files are also supplied as per customer’s requirements. 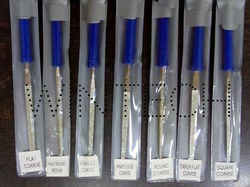 We are offering Diamond Needle Files to our client. 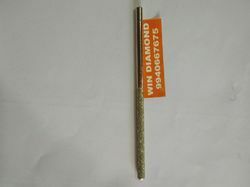 WIN WIN Diamond Needle Files are manufactured by electroplating diamond on to steel blanks using nickel. The smaller the particles, the finer the grit of the file. This is why diamond files are referred to in grits rather like sandpaper. Diamond Needle Files finishing on material where the hardness makes conventional files ineffective used by die and mould makers and special manufacturing applications on materials such as hardened steel, ceramics, glass, graphite, etc. We are offering Diamond File to our client. Applications: Glass , Stone and ceramic.